The one I have was from a Luxury Barber box a few years back. Since I test so many shaving soaps this one got lost in the crowd until now. I have the sample size but the regular pucks are 5oz. Mine came wrapped in cellophane and was very easy to remove. This prompted me to look for my shaving mug which I won from an eBay bid a few years back. I finally located it with a few items inside. I figured this would be the best way to see how both the mug and the shaving soap perform. 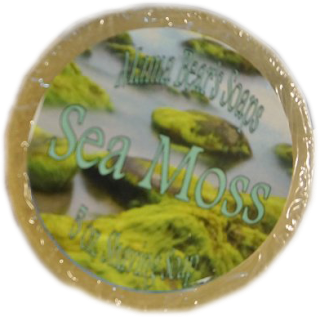 The scent of Sea Moss is described as a unique blend of Bergamot, Orchid, Jasmine, and Violet with supporting notes of Ozone (air), Sandalwood, Musk and of course, Moss. This fragrance could be described as fresh, green and almost a little kelp-y. When I reviewed this in the video I described it as a floral and I’m sticking to my first impressions. Lather was not an issue for this soap once I dropped the puck into the mug and added warm water to the brush it lathered up instantly the loading only took a min or two. Next, I just wet my face a little and began to face lather and it really got right into the beard and provided great coverage. This doesn’t happen often but during this shave, I did have a slight irritation from the soap. It wasn’t so bad that I had to stop the shave but it was noticeable. After the shave, the scent was pretty much gone. The slickness and glide were adequate allowing me to go to trouble spot without too much irritation and the post shave feel was good as well. For me after trying and reviewing so many other products from artisans and big brand companies alike sadly I have to say I would not go back to them. I wanted to like them but I must be honest that my experience with this one was not good. That being said maybe I shouldn’t judge all of them by this one bad apple so I’ll give them another try but for now I can’t recommend them. A word about the website, even though its functional I do believe it’s time for a redesign. Things could be easier to find and the graphics and style are getting a bit long in the tooth. A redesign might even bring more people to the site. Of course, all of this is just my opinion and like I’ve always said it’s only worth two cents.